A Friday night match in Reno had two Las Vegas teams in a head-to-head contest with only one advancing to the Nevada State Championship finals. Those two teams come from prominent southern Nevada high schools with traditionally strong volleyball programs, namely Bishop Gorman and Faith Lutheran. Bishop Gorman came out of the gates flat but found their rhythm to eventually top Faith Lutheran in a three set sweep. At the top of Gorman's statistical leaderboard was no other than junior outside hitter, Tommi Stockham. “Faith played a good game but our energy started out slow...in the end we came out stronger.” said Stockham. Recording 16 kills, Stockham’s success in the front row last night helped her maintain the MaxPreps #1 kill leader spot in the state of Nevada. Overall Stockham has recorded 354 kills, 57 service aces and 216 digs in her junior season this year. It comes as no shock that this young athlete is making a name for herself nationally throughout the volleyball community. On March 11, 2015, as a high school freshman Stockham announced her verbal commitment to continue her education and volleyball career at the University of Southern California, not only as an indoor player but on the beach as well. Stockham will be the university’s first athlete to compete in both sports leaving her the potential to be USC’s first player to win an indoor and outdoor national championship. In an interview conducted this morning, Stockham explained that her recruiting process began quite early as she began competing on the beach prior to competing on the wood early in her career. This ultimately led to quicker exposure compared to her peers. According to Tommi, USC had always been the university she wanted to attend since her early playing days back in 7th grade. Her love and passion for the indoor side of the game wasn’t relevant until later on, so when USC provided the opportunity for both indoor and outdoor play Stockham couldn’t pass it up. “Indoor is for me, I just enjoy it more, there’s a bigger team aspect to it than the beach,” she said. 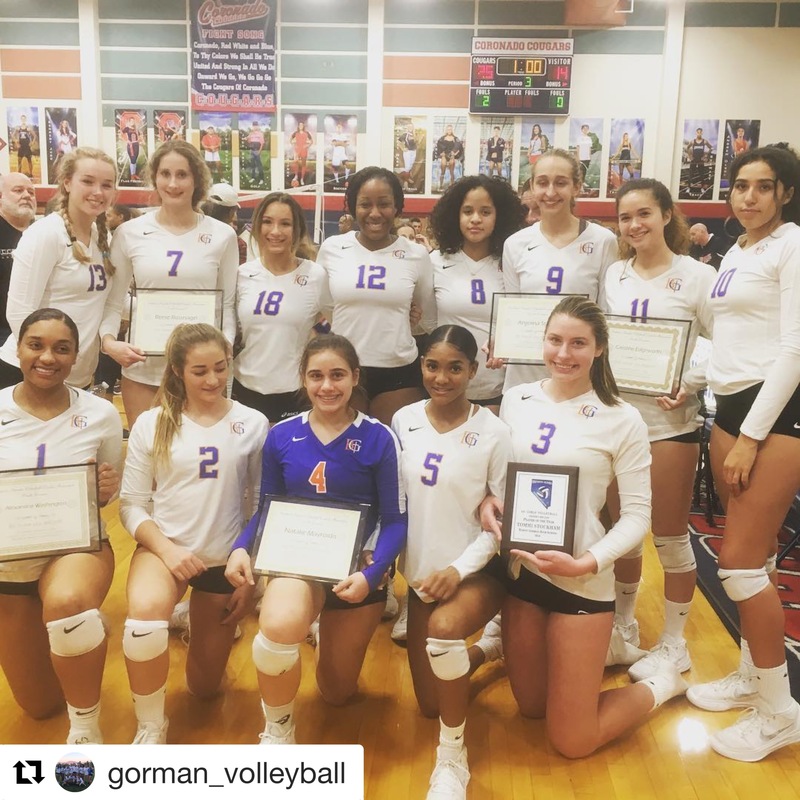 Stockham’s passion for the indoor game is quite noticeable as she and the rest of the Bishop Gorman Gaels compete for the Nevada Division 4A State Championship tonight in Reno against Reno High School. The fact that it’s a home game for Reno already puts the Gaels one step behind their opponent as Reno High School will have the hometown advantage. Gorman leads Reno as the better team statistically this season, but with pressure on and a state championship ring on the line almost anything can happen. An exciting overview for tonight’s matches sees Stockham, Maxpreps #1 kill leader in Nevada, neck-and-neck with the Maxpreps #2 kill leader, Kaitlynn Biassou committed to play at the University of New Mexico. Stockham explains that her coach Gregg Nunley has planned for the team to add pressure to Biassou in order to minimize her offensively early on in the game play. During this upcoming club season, Tommi will again suit up in pink for the Dig This! Volleyball Club playing with fellow Player of the Year and UNLV commit Palo Verde setter, Arien Fafard. Tonight’s State Championship game can be viewed live online at NFHS.com with first serve set for 4pm. DearVolleyball.com wishes the Bishop Gorman Volleyball team the best of luck for tonight's match. Here’s to the Gaels bringing a State Championship back to the Las Vegas Valley!